[typewritten:] II. MARÍA CANO MARTÍNEZ SERVICE AWARD ago this week, María Martínez was honored by LULAC for her lifetime of service to her people, our people. Shortly after this honor was bestowed upon her, María succumbed to breast cancer at the age of 58. Her legacy of service continues to impact our lives and to inspire us, even today as we commemorate the 68th anniversary of her birth on May 10th. Like tonight's recipient of this award, the first person so honored by the University of Iowa, María encouraged me to achieve educationally, and to use what I learned to serve my community. Like tonight's recipient, she offered me constant words and deeds of support, beginning with the phrase "You kids, need to do this or that..." a phrase I know Perry has uttered many a time. 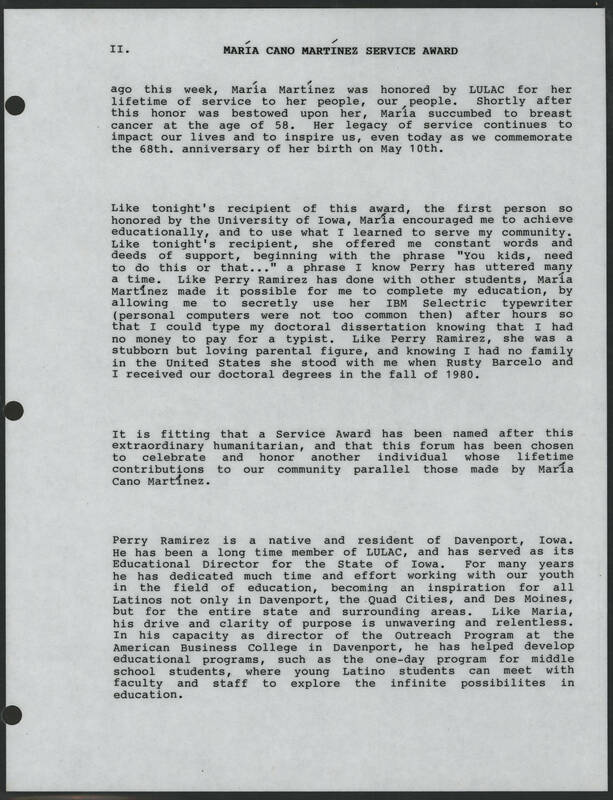 Like Perry Ramirez has done with other students, María Martínez made it possible for me to complete my education, by allowing me to secretly use her IBM Selectric typewriter (personal computers were not too common then) after hours so that I could type my doctoral dissertation knowing that I had no money to pay for a typist. Like Perry Ramirez, she was a stubborn but loving parental figure, and knowing I had no family in the United States she stood with me when Rusty Barceló and I received our doctoral degrees in the fall of 1980. It is fitting that a Service Award has been named after this extraordinary humanitarian, and that this forum has been chosen to celebrate and honor another individual whose lifetime contributions to our community parallel those made by María Cano Martínez . Perry Ramirez is a native and resident of Davenport, Iowa. He has been a long time member of LULAC, and has served as its Educational Director for the State of Iowa. For many years he has dedicated much time and effort working with our youth in the field of education, becoming an inspiration for all Latinos not only in Davenport, the Quad Cities, and Des Moines, but for the entire state and surrounding areas. Like María, his drive and clarity of purpose is unwavering and relentless. In his capacity as director of the Outreach Program at the American Business College in Davenport, he has helped develop educational programs, such as the one-day program for middle school students, where young Latino students can meet with faulty and staff to explore the infinite possibilities in education.